MONTAGNE: That's the very simple, beeping sounds of the first commercially successful video game ever: "Pong." After that tennis sports game grabbed the attention of kids in arcades and transformed video games into hugely popular and mainstream entertainment, "Pong" invaded America's living rooms with the Atari home system. That was nearly four decades ago. The industry has evolved just a bit since then. 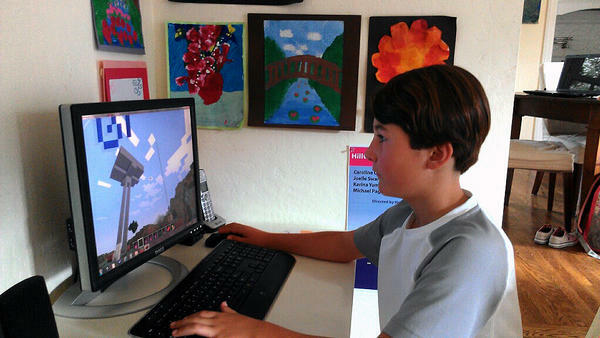 Today, most video games are connected to the Internet, which means while kids interactively play with people across the globe, gaming companies can research and analyze how the young gamers play and what choices they make. As NPR's Steve Henn explains, collecting such data helps video game companies influence gamers' playing and spending habits. STEVE HENN, BYLINE: What is your favorite video game? MAX KELMON: "Call of Duty." AUSTIN: There's "Balloons Tower of Defense 5," which is really fun, and "Clash of Lords." It's kind of like the Android version of "Clash of Clans," which a lot of people play. MONTAGNE: Meet Austin Newman, Max Kelmon, Jack Davison and Wilson Eisner. They're all between 10 and 13 years old, and they all love games. Their parents are less universally enthusiastic. MICHELLE DEWOLF: A lot of the games are set up so that you can't just stop. If you stop, you lose points or you lose money - or you lose something. VANESSA KELMON: I mean, he could play Xbox for 12 straight hours. He's got friends in Mexico City, friends in England. You know, at first - I hate it. I really do because they just sit all day. And he could play it all day long. DEWOLF: And so he can be reduced to tears because he has to stop, and then the game - he loses out on something. KELMON: And I was like oh, my God. You're - I'm offering you to go, like, go play tennis or go play golf or do something really fun. And I'm making you shut this down, and you're crying about it. I mean, he's really addicted. It's horrible. HENN: That's Michelle DeWolf, Vanessa Kelmon and Sara Eisner. In their families, video games are a source of intense love and intense hate. And that's true in millions of homes because video games are incredibly compelling. You might not believe that if you don't play them, but you can get lost in a great game. They make you feel good. And it's no accident. RAMIN SHOKRIZADE: The technology for this has gotten quite sophisticated. HENN: Ramin Shokrizade is a game economist for Wargame America, a big gaming company. [POST-BROADCAST CORRECTION: The name of the company is Wargaming America.] He began his career as a neuroscientist, and then studied behavioral economics. He got into games because it gave him a chance to study people in a natural setting instead of a lab. SHOKRIZADE: I vowed that I would not continue doing research in this space until I got the consent of a human population to do so. And in this case, I have a ready population of consenting adults that I'm able to observe now, in the gaming space. So I'm quite happy about that. HENN: When I started playing games at friends' houses 35 years ago, neuroscientists and behavioral economists were not in the mix. Game companies had no idea what my buddies and I did with a game once we bought it and brought it home. But today, most games let you buy stuff - virtual goods - right inside the game. HENN: Like a new gun in "Call of Duty," or a cow in "Farmville." And almost every game is connected to the net. So game designers are tracking every click, and collecting data about all of us, while we play. SHOKRIZADE: At this point, every major gaming company worldwide either has, in place, a fully developed business intelligence unit, or they're in the process of building one. HENN: Ramin Shokrizade's job is to get people to buy those virtual goods inside games. One of the tricks of the trade is something game developers at Zynga used to call fun pain: basically, make gamers uncomfortable, frustrate them - take away their powers, crush their forts - and then at the last second, offer them a way out, for a price. SHOKRIZADE: If it's a child, how do you even get consent for something like that? HENN: What Ramin Shokrizade is saying is that as we play games, game developers are running tests on us and our kids. They're asking themselves, what can they tweak to make us play just a bit longer? What can they change to get us to spend some money inside a game and buy something? What would make the game more fun? So as millions of us play, designers introduce little changes, and get answers to all these questions in real time; and games evolve. JOHN DAVISON: Now, shipping a game is just the beginning. HENN: John Davison's been playing and writing about games his whole life. He now works at the video game company Red Robot Labs. He says little, free-to-play iPhone games - like "Candy Crush Saga" and "Puzzles and Dragons" - have become brilliant at using these tests to figure out exactly how to get people to spend money. DAVISON: You know, people go, oh, yeah, I've got that on my phone. And then you tell them that well, those games make millions of dollars. And they're like, yeah, yeah, yeah - every day. And it's like, oh, my God. HENN: Many of the people spending cash are kids, including John Davison's kids. DAVISON: So my kids - we were on vacation this year, and my kids had just gotten in to "Clash of Clans." HENN: ...on forts or weapons. DAVISON: They were clearly getting a lot of enjoyment out of it. But it did get to the point where me and my wife were like, do you really want to be spending everything on this, you know? HENN: And this is from a man, we should say, who's devoted his life to video games. DAVISON: Well, yeah, yeah. And it's like, you know, I was trying to sort of total up in my head how much the kids had spent on this game. But there was also a degree of admiration for the team at SuperCell, that they managed to get under my 10-year-old's skin to this degree. HENN: Getting under a kid's skin has become a science. Apple recently settled a class-action lawsuit about kids making in-app purchases like this, without their parents' permission. And the European Union is considering new regulations on games. In Menlo Park, Calif., Michelle DeWolf banned her son, Austin Newman, from playing games during the school week. DEWOLF: We were giving him 30 minutes a day, and he couldn't handle the time during the week because he couldn't stop thinking about it. And so he couldn't think about doing his homework. He couldn't think about walking the dog, or helping in any other way, because he couldn't get his mind off the idea that he had 30 minutes coming. Once he knew there was nothing, he didn't think about it during the week. And he almost - maybe I'm not objective - but he almost seemed relieved. HENN: The truth is, when kids sit down with a video game today, they're not just zoning out in there, all alone. There are very smart people on the other side of that screen. HENN: A few may have an agenda. Most just want to make a great game, but they're all paying close attention to how kids play and doing their best to make it very hard to stop. DEWOLF: Guys, interview's over. Two minutes. Turn off the games. HENN: Steve Henn, NPR News, Silicon Valley. Transcript provided by NPR, Copyright NPR.